Eating can still be fun when you're on the run. Skip the drive through and stop in, order online or call ahead to Shredded Tacos where you can get a perfectly-packed To Go box with your choice of shredded beef or chicken tacos stuffed with lettuce, cheddar cheese, tomatoes and, for the chicken, ranch/cilantro/chipotle dressing. Plus, every order comes with chips and Jean's famous salsa. 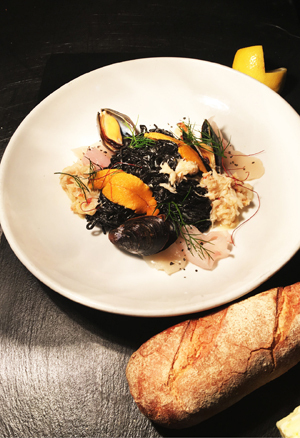 Need more incentive to meet your next great foodie find? Fall in love: Buy a four-pack of tacos and get a second four pack for 50 percent off. 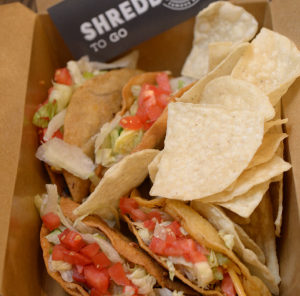 Shredded Tacos is brand spankin' new and located on Newhall Ranch Road near The Paseo Club in Valencia. Never underestimate the power of the breakfast beverage. When a place claims to have the best Bloody Mary in town, verification is in order. (It's a tough job, but someone has to do it!). 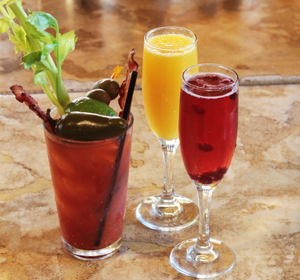 After one sip of the Egg Plantation's freshly handcrafted Bloody Mary, you'll be coming back for more than just the Homemade Quiche and the Huevos Rancheros. Want something sweeter? The Mimosa and Pom-osa are exceptionally-refreshing alternatives to brighten your morning. Nothing says romance like oysters and the gourmands at Oaks Grille at TPC Valencia know this all too well. 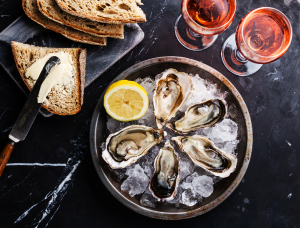 Enjoy a delicious four-course gourmet dinner with a champagne toast, an oyster bar for two featuring oysters on the half shell with chili mignonette and fresh gremolada, arugula salad and your choice of New York Steak, Pan Seared Chicken or Pappardelle Pasta. The conclusion to this feast is just as sweet: light and fluffy chocolate olive oil cake. Your night out is only $95 per couple; reservations are required by February 8. Valentine's Day isn't just about that special someone you love - it's also an excuse to eat the food that you crave! 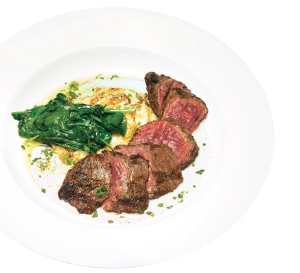 You'll fall in love all over again with Marston's Hangar Steak, served with parmesan scalloped potatoes with spinach and red wine reduction. 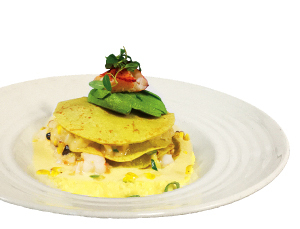 In addition to all of your traditional favorites, enjoy their special Valentine's Day a la carte menu. Reservations are required. Valentine's Day is Tuesday, February 14. Nothing says romance like an exquisite four-course dinner by candlelight and live music with that special someone at Newhall Refinery. Throw in a couple of their exceptional cocktails or craft beers plus the convenient complimentary valet, and you're set up for a night you'll always remember. The cost is $165 a couple and reservations are required. Tickets are available online. A Week of "I Love You's"
With Valentine's Day on a Tuesday this year, a late night of romance might not fit into your work and school schedule. What to do? Share the love all week long!Valentine's "Weekend"
Many will celebrate V Day the Saturday and Sunday prior. Expect longer waits at your favorite restaurants (Get on those reservations now!) or reserve a table for Monday or Tuesday and spend the weekend outside instead. Hike Towsley Canyon for romantic views! It's going to be tough to get a sitter the weekend prior to Valentine's Day as well as the day of. Now's the time to arrange for a swap with family friends ("Let us take your kids on Friday night, then you take ours on Saturday evening!"). The kids get a sleepover with friends and you get to sleep in after date night. Break the "candlelit romance" rules and hold hands over a lavish lunch any day this week. Sure, you might have to go back to work right after, but there's no better reason to take a delicious break in the middle of the day than your shared love of food and each other. They say that variety is the spice of life. I say less talking, more eating! Either way, everybody's happy at Fish Tail Seafood Grill where you create your own delicious entree from a list of fresh choices. 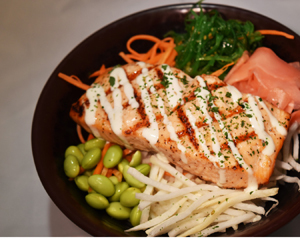 My new fave is the Salmon Bowl served with your choice of sushi rice, steamed white rice, steamed brown rice or romaine heart salad, then topped with Wakame salad, daikon, daikon sprouts, carrots, cucumber, ginger, sesame seeds, shredded nori and house-made White Sauce and some of the freshest, most flavorful salmon you've ever tasted. Sharing is caring, which is why, when you order an entree like the delicious Pollo Asado Bowl from Chronic Tacos that's stuffed to the brim with their delicious marinated grilled chicken, you'll get a freebie, too. 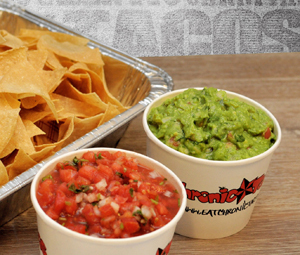 Right now, score free chips and guac with any entree and beverage purchased with the ad on page 63! Generosity never tasted so good. Looking for the perfect place to eat after a movie? Salt Creek Grille just introduced their new Late Night Happy Hour every Friday and Saturday on their heated patio from 10pm to close. 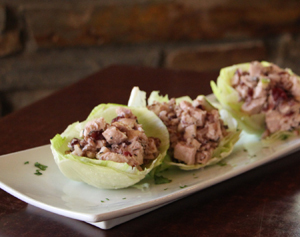 The Chicken Salad Lettuce Cups are to die for - chicken, pecans, green apple, dried cranberries, shallots, Greek yogurt and apple cider vinegar served in lettuce cups for only $9! That's some fine late-night dining. Just when you thought you couldn't be happier at Xevichez on Town Center Drive, they created the world's best Happy Hour that'll inspire you to clear your schedule from 2pm to 6pm on the regular. ($20 All You Can Eat sushi makes this a mandatory appointment for me a minimum of twice a week.). For a limited time Monday through Friday from 2pm to 6pm, enjoy $3 draft beers and $5 micheladas from the bar, or try one of their surprising new wines like Angeline Reserve Cabernet, Line 39 Pinot Noir, Seaglass Pinot Grigio and more. 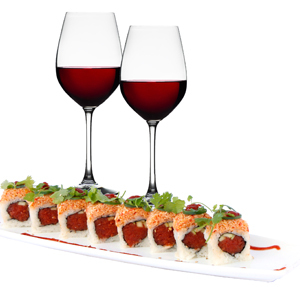 The real draw, though, is the jaw-dropping $20 All You Can Eat sushi Happy Hour special. 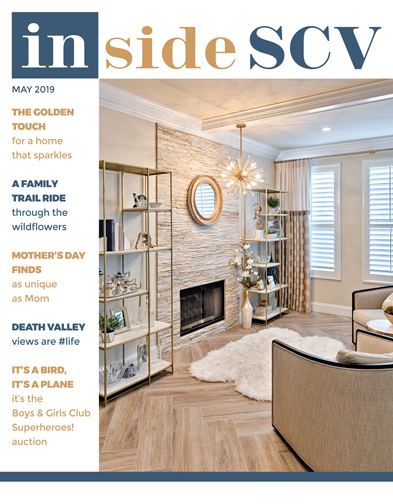 For the most fabulous 60 minutes of your day, you'll choose from Santa Clarita's best new sushi menu and get to know the sushi-making artists that will rock your socks off with Japanese Mexican fusion flavor. Don't have an hour? Order the Lunch Special for only $9.99. It includes one fresh roll, soup, salad and a soft drink. Of course, all this tastiness can also be had after 6pm. Xevichez is open until 10pm six days a week; the hot spot is open until 11pm on Fridays.